Will Made in China 2025 succeed in making China the world’s leading producer of high value technology? Is China really a threat to the world’s industrialized economies? On this episode, George Magnus discusses four “red flags” that may complicate China’s plans for growth­. Have we entered a new Gilded Age? Are Facebook, Google, and Apple today’s Standard Oil, Northern Securities Company, and US Steel? On this episode, professor Tim Wu discusses the history and legacy of antitrust law in America, as well as whether it’s time to break up big-tech. Is Sen. Bernie Sanders’ ‘Medicare for All’ proposal really Medicare for all? And what are the real costs associated with single-payer health care? 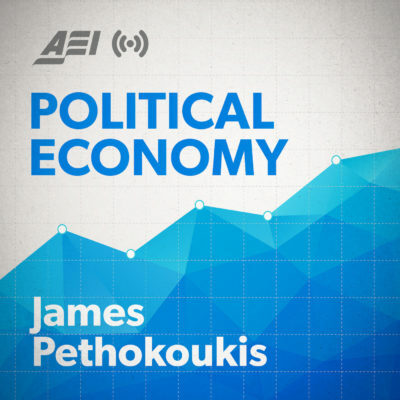 On this episode, AEI’s Benedic Ippolito discusses the oft ignored implications of the health care plans popular among 2020 Democratic presidential hopefuls. Benedic Ippolito is a research fellow in economic policy studies at the American Enterprise Institute where he focuses on health economics. Should we worry about the size of the trade deficit? How do we bring back American manufacturing? Why aren’t wages growing more quickly? On this episode, economics professor and BBC presenter Linda Yueh discusses how twelve of the world’s greatest economists might respond to these questions and more. Rep. Alexandria Ocasio-Cortez has said it “absolutely” should be part of our conversation about the economy. During the presidential campaign, Sen. Bernie Sanders’ chief economist was an adherent. But what the heck is Modern Monetary Theory? On this episode, economist and AEI scholar Stan Veuger breaks it all down, discussing his latest article for AEI Economic Perspectives titled Modern Monetary Theory and Policy. Stan Veuger is a resident scholar here at AEI where he specializes in political economy and public finance. As China continues to become economically and militarily dominant there is a tendency in Washington to act as though it all could have been prevented. But could China have been stopped? On this episode, China specialist and AEI fellow Zack Cooper walks us through how and why China failed to be incorporated into the international order as well as the futility of Trump’s tariff regime in changing Chinese behavior today. Zack Cooper is a research fellow here at AEI, where he studies US defense strategy in Asia and US-China competition. Nations compete across many dimensions, but in the coming years perhaps no competition will be as fierce or as important as the one for talent. Harvard Business School Professor William Kerr explains why in his new book, “The Gift of Global Talent: How Migration Shapes Business, Economy, & Society,” which he joined my podcast to discuss. William Kerr is Professor at Harvard Business School and Co-Director of the school’s Managing the Future of Work initiative. He’s also a recipient of the Ewing Marion Kauffman Prize Medal for Distinguished Research in Entrepreneurship. You can download the episode by clicking the link above, and don’t forget to subscribe to my podcast on iTunes or Stitcher. Tell your friends, leave a review. Who will surveil the surveilers? One response to stepped-up surveillance is stepped-up effort to hide from it — more laws regulating what people and governments are allowed to record, and more funds devoted to encryption and other privacy-protecting resources. But author and scientist David Brin says while this approach reflects the right instincts, it is insufficient. Especially as technology advances, there will be no hiding from surveillance. What we should instead fight for is transparency: the watchers must feel just as exposed as the watched. It’s a perennial story. The demise of mom-and-pop stores, the shuttering of small businesses across the country, the undercutting of local sellers by massive corporations — in short, the retail apocalypse. But economist Michael Mandel has looked at the data and finds a much different story. Not only is the economy adding more jobs than it’s shedding thanks to the massive online retailers allegedly wreaking havoc across the United States, these new jobs actually pay more as well. How permissive should US immigration policy be? What attributes should we require of the immigrants the United States does admit? And how does immigration affect those already living in the US, both native and foreign born? Reihan Salam answers all these questions and more in his new book, “Melting Pot or Civil War? A Son of Immigrants Makes the Case Against Open Borders,” which he joined the show to discuss with me. Reihan Salam is executive editor of National Review and a National Review Institute fellow. He’s also a contributing editor at The Atlantic and National Affairs, and is the coauthor with Ross Douthat of “Grand New Party: How Conservatives Can Win the Working Class and Save the American Dream.” You can follow him on Twitter @Reihan. Imagine the elites of China, Turkey, Britain, and all the other great powers of the day meeting in Davos in 1600 to discuss who among them would emerge as the world’s greatest economic power over the next few centuries. None would have even considered North America, and yet it is the United States that today produces the plurality of world GDP with less than 5 percent of the world’s population. How did that happen? In the excellent new book “Capitalism in America: A History” Alan Greenspan and Adrian Wooldridge provide the answer. Adrian recently joined me on the show to discuss his book, American and world economic history more broadly, and the lessons voters and policymakers should draw today. Adrian Wooldridge is the political editor and Bagehot columnist at The Economist and the author of “Measuring the Mind: Education and Psychology in England, 1860–1990.” You can follow him on Twitter @adwooldridge. “The entitlement crisis is real, and it is worse than you think.” So argue James Capretta and Yuval Levin in a recent cover story in The Weekly Standard. As they write, the CBO projects that under plausible assumptions, the government’s cumulative debt will grow from 78 percent of GDP this year to 148 percent in 2038 and to 210 percent of GDP in 2048 — and even a total repeal of last year’s tax cuts won’t come close to mitigating that rise. To discuss how deleterious this debt load will be for the United States, and what steps can be taken to prevent it, I am joined by my AEI colleague James Capretta. James is a resident fellow and holds the Milton Friedman Chair at AEI, where he studies health care, entitlement, and US budgetary policy. An associate director at the White House’s Office of Management and Budget from 2001 to 2004, he was responsible for all health care, Social Security, welfare, and labor and education issues. You can download the episode by clicking the link above, and don’t forget to subscribe to my podcast on iTunes or Stitcher. Tell your friends, leave a review. Last week President Trump announced a new trade agreement with Mexico and Canada, which he has christened USMCA — but most people refer to simply as NAFTA 2.0. President Trump understanably wants to differentiate his trade deal from the one he deemed the worst trade agreement in this country’s history, maybe ever. But many trade analysts say NAFTA 2 is not much different than NAFTA classic. One such analyst is Claude Barfield. In this episode, we talk about the differences between the two deals: how it has improved, and the updates that make it worse (at least from a free-trade perspective). We also discuss US trade policy more generally, and close with the subject of US policy toward China.